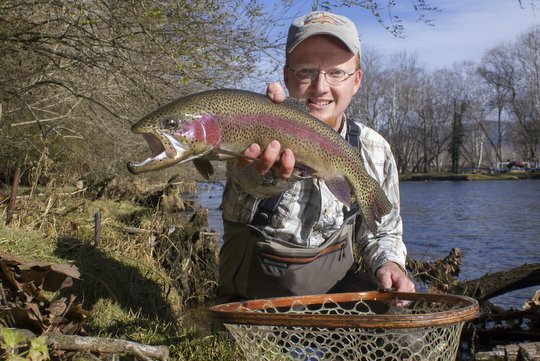 If you are interested in streamer fishing for big trout, the time is now. Find out more in the February update from Trout Zone Anglers. Cold. That has been the theme for this winter. For one stretch back in early January, streams were mostly too frozen over to fish, with the exception of tailwaters of course. At one point it was bad enough that a day above freezing was a warm day. Not that I mind cold days, but they do tend to put a damper on fishing activities. On top of that, I was busy the last half of January with two weeks of classes towards my outdoor education masters. The second of two weeks at the intensive was spent staying at a gorgeous lodge on the Watauga. Sadly, fishing was not the goal, so I mostly had to stare longingly from a distance. The intensive ended on Friday just before noon, and I didn't need to be home until evening. With a couple of hours to spare, I hit the drive thru at Taco Bell for a couple of burritos and then headed up the Watauga to look for a good place to fish. Meandering up the river, I made it all the way up to Wilbur Lake. With no itinerary other than enjoying a few hours off, I wanted to see the scenery while I was there. As I headed back down the river, a plan started to crystalize in my mind. My car just naturally took me to one of my favorite access points on the river for wading and soon I was gearing up. The day was warmer than any we had experienced for a while. I debated whether to wear my jacket or not. Realizing I would be too warm if I wore it, I just wore the long sleeve shirt and that was all I needed. The sun was toasty on my back and bright in my face every time I turned to fish towards it. Accordingly, I tried to fish with the sun at my back as much as possible. A nymph rig seemed appropriate, although I saw just enough Blue-winged Olives and the occasional rise to convince me that fish could also have been caught on a dry fly. I also carried a streamer rod. Over the course of my two hours on the water, I caught all my fish on the nymphs, but moved some really good fish on the streamers. Unfortunately none of the streamer chasers connected with the hook, but next time I'll know where to look. In the two hours I fished, I quickly lost track of how many I had caught. That isn't as impressive as it sounds, however. First, I normally lose track somewhere between fish number three and fish number five or six. Second, it appears that TWRA had done a thorough stocking job recently and dumped a bunch of fingerlings in the river. I didn't mind though. It was good to catch a few trout and there were just enough nicer fish mixed in to keep things interesting. The day was close to winding down when I noticed that I had missed a call from a long-time client. I paused from my fishing long enough to call Tim back and he inquired how my day was going. He fishes the Watauga a lot and knew I was planning on fishing it a little. When I told him where I was fishing at, he gave some pretty specific directions. Wade to this spot, throw towards this log, let it drift down as far as you can, and repeat. Figuring I had nothing better to do and with time slipping away, I waded carefully into the described spot and started fishing. As I fished through the spot, a strange thing happened. I was standing in the middle of the river when a drift boat bore down on me from above. Looking behind and realizing there was plenty of room for them to go around, I stayed put. The strange part was that they never even attempted to avoid my section of the river. With even depth all the way across, they opted to float past about 10 feet in front of me and right through the water I was fishing. Apparently some of the upper east Tennessee guides aren't as polite as the ones from Knoxville and points westward. Oh well, the day was too beautiful to let something like that ruin things for me so I shrugged a little and kept fishing. With only minutes to spare, I noticed a large fish rise to inspect my indicator before hunkering down again. Big mistake on the part of the fish. I cast repeated to the spot until the fish realized how delicious my Pheasant Tail nymph looked and ate. The fight was a bit nerve wracking. Some fast rapids just downstream were exactly the sort of place you don't want to fight a hefty trout. With some solid pressure from my 9' six weight Orvis Recon, the fish turned and finally slid into the net. The big male rainbow had a perfect kype jaw. If this fish lasts another year or two in the river he will be a genuine monster. That trout was the perfect consolation after having some less than polite people float through my spot. I had already pushed my self-imposed quitting time. With one last glance at the place I had caught the big trout, I turned and made my way out towards the car with another satisfying outing under my belt.